An essential part of Scandinavian culture and a regular inspiration for shouts of "Skol!" 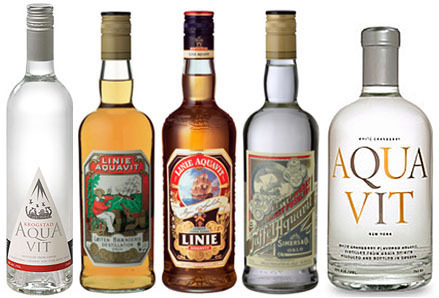 worldwide, Aquavit is a a boozy staple that is a must try for any visitor to Scandinavia. Aquavit or aqvavit is a traditional spirit that is produced in Scandinavia, where it has been produced since the 15th century. Traditionally aquavit contains 40% alcohol by volume and it's distinctive flavor from spices and herbs, and the main spice should be caraway or dill. Akvavit, like vodka, is distilled from either grain or potatoes is flavoured after distillation with herbs, spices, or fruit oil. Aquavit usually has a yellowish hue, but this can vary from clear to light brown, depending on how long it has been aged or the amount of colorant used. The word "aquavit" is derived from Latin aqua vītae, "water of life" which some may argue is an ironic name for an alcoholic drink. Aquavit often consumed with no mixer in shot or "snap" form. "Snap" is the Danish and Swedish word for a small shot of a strong alcoholic beverage taken during the course of a meal, a ritual that is associated with holidays such as Midsummer, Christmas and Easter. Many Scandinavians claim that aquavit has a variety of medicinal properties and consumption of the drink eases the digestion of rich foods while others claim that drinking any such medicinal properties could be attributed to being drunk enough to forget one's ailments. So whatever your ailment may be (soberness included) aquavit is sure to solve the problem!